let’s dress up the prettiest clothes, wear a charming mask, do a gorgeous makeup, and see who is the shining star! Dress in the best and show your friends! You are capable to do this!Every girl loves go to fashion salon. Design and create your own makeover on a model. Change hairstyles, accessories, and makeup. You can use the cosmetics on the screen. Also, you can choose earrings, lipstick, blush, foundation, mascara, eyeshadow, or liner colors you would like to try on. What's more, you could match the model with different kinds of clothes, skirt until you found the most beautiful one. You will witness the born of the prettiest girl. This game is so cool! You can't miss it! *Use any image as Wallpaper for all kinds of phones! Looking for good makeup games for kids? This game is your best choose! 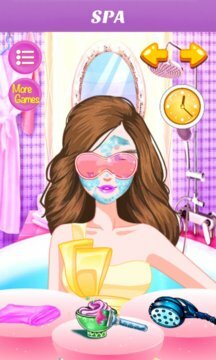 When you are done giving your model a makeover, e-mail a copy to your friends and family or save it to your phone.Try one of the funniest makeover game, and you will never regret! If you're into craft games and want to try something new, this game is just what you need! Thus, what do you wait for? Download and play it right now!